so my boyfriend tom is a nerd. it’s not a secret and i love him more for it. 🙂 the movie star trek premiered recently and so i decided to create tom a feast fit for a, well, star trekkie. scrag is the roasted haunch of the animal garbat, marinated in it’s own blood and served with ten different spices. it is one of the finest achievements of klingon culinary arts. obviously, i can’t make kitt travel at warp speed and jump over to klingon territory to pick up garbat, so i created a meal based on tera’ngan ingredients. it is shown above with andorian ale (wheat ale, goose island brewing co., chicago) and a small loaf of multi-grain bread. using a tip of the knife, cut small slits all over the lamb. wedge the garlic slices into the lamb, using as much (or as little) as you like. rub the lamb with evoo, salt, pepper. place the lamb in a large roasting pan, squeeze the juice of two lemons over the lamb. arrange the veggies around the lamb, season them to taste with paprika, add 1/4″ water to the roasting pan. roast lamb and vegetables in the oven for 30 minutes at 500°. turn oven down to 300°, roast lamb and veggies for an additional 2.5 – 3 hours. continue to baste with juices and additional lemon juice until a meat thermometer reaches 160º. 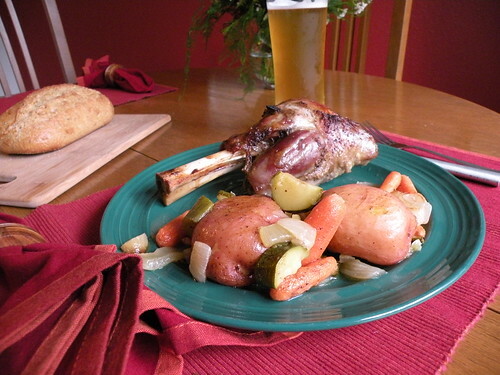 serve the shanks whole on the plate, with additional veggies, bread and andorian ale. really, i am not a fan of lamb because of it’s texture and strong flavor. i think that the next time i try to re-create scrag, i’ll stick with good ole chicken. the lemony flavor works well with both the veggies and the chicken. 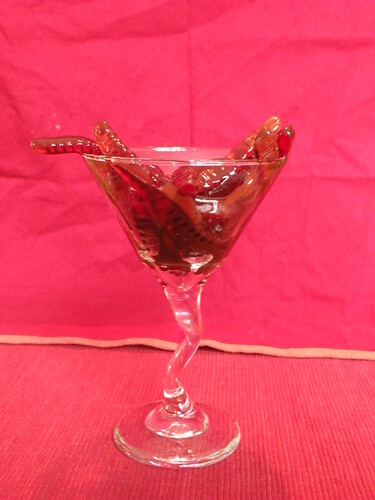 gagh is a klingon delicacy – unprocessed serpent worms. klingons prefer to eat them live, i prefer to eat them for dessert. You’re the best! Very creative babe….